No longer playing second fiddle to broccoli, cauliflower is enjoying its share of the limelight. 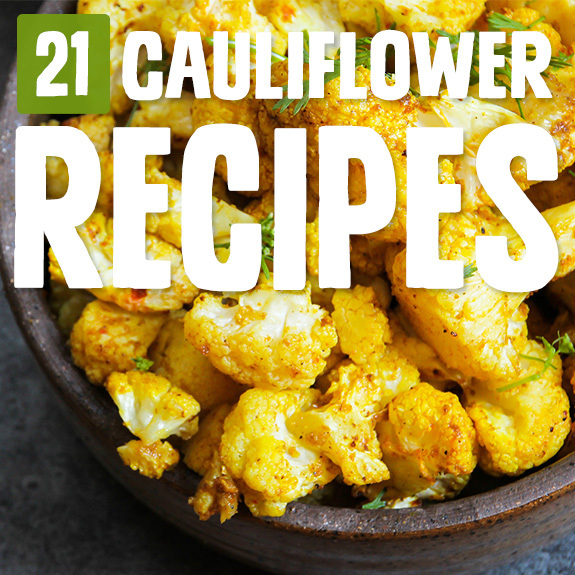 So versatile, and blending in with just about any ingredient you can think of, these cauliflower recipes show off this cruciferous veggie. Roasting your cauliflower brings out the full flavor and adds a hint of sweetness to any vegetable. With simple seasoning, like in this recipe, the flavor of the vegetables is allowed to sing. To keep Paleo, use this as a side dish to a hearty protein. 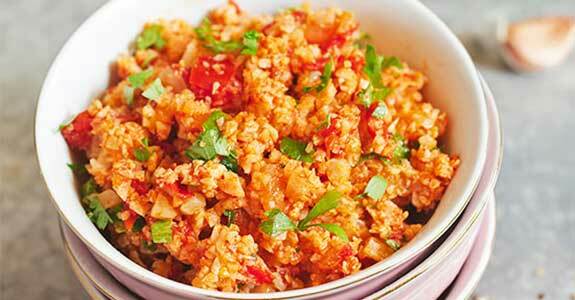 Spice things up when you make this Mexican cauliflower rice. It’s the perfect side dish to any Mexican cuisine but also works with any main dish to add in a cruciferous vegetable. The bonus is that it’s not hard to make at all. Turmeric lends this version of roasted cauliflower a bright yellow-orange color and complements the cauliflower’s earthy flavor. Ground pepper, garlic, and oregano round out the flavors to make this a complex-tasting and belly-warming dish. Grab your favorite protein and you’ve got a great Paleo meal! Most people think of cinnamon as a sweet spice, but it’s actually quite versatile and is great in savory dishes. This would be a great fall or winter side dish, but could make a good summer picnic dish to pass as well. While this could go with any protein, it would stand up particularly well to a roasted pork loin. Who says soup is difficult to make? This curry roasted cauliflower soup proves the opposite! Roasting the cauliflower gives this veggie a hint of sweetness and when you blend it all up, the cauliflower becomes silky and creamy – just what you might want on a cool fall evening. The crispy kale gives this dish color and a wonderful crunch. Most people think of cauliflower in its many preparations as a fall or winter food but here is the perfect summer cauliflower dish. Could you use raw cauliflower for this dish? Sure, but did you know that roasting cauliflower actually makes it healthier? That’s right! 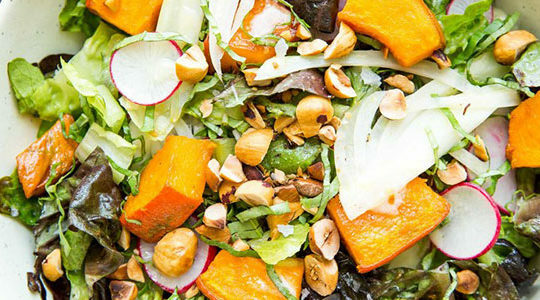 So roast away, both for taste and health, and mix with a bunch of other crunchy veggies. 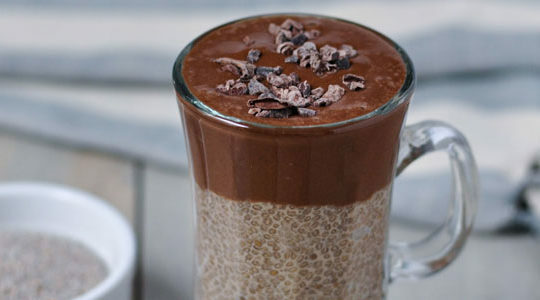 Consider this a Paleo dieter’s treat. Not all Paleo eaters will chow on cheese, but if you’re going to, Parmesan is a good one because it is not as processed as many packaged cheeses are. Plus, Parmesan has a milky-earthy taste that pairs perfectly with roasted cauliflower so take a Paleo risk and treat yourself to this dish tonight. Purple cabbage, especially when roasted – which makes the color pop – is almost too pretty to eat! ALMOST. And chimichurri goes great with any meat, but this dish would be perfect with a nice steak. You’ll get your protein and iron from the steak and all sorts of good-for-you vitamins from the cauliflower and sauce. Gremo-what? Gremolata! It’s a classic Italian combination of garlic, lemon, and parsley and boy is it good! It’s also great on everything, but it brings a great punch to roasted cauliflower. Note that this recipe gives you options as far as oils go. Ghee is clarified butter and totally Paleo acceptable if you don’t have coconut oil on hand. Hummus – the dip, the spread, the okay-sometimes-I-eat-it-by-the-spoonful – the wonderful Middle Eastern creamy, nutty invention. But sometimes you just want to change it up a smidge. This is the perfect alternative. You get all (or maybe even more) of the fiber you would from chickpeas but with an extra earthy, roasted flavor from the cauliflower. Spoons ready? Are you one of those people who thinks they don’t like cauliflower? 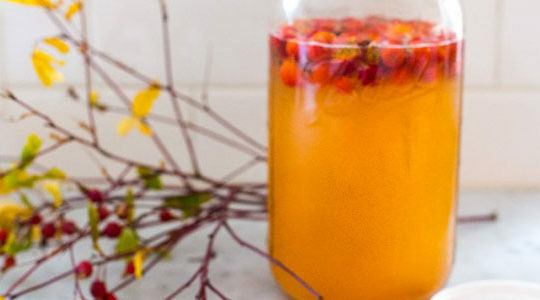 Well this recipe will change your mind! Don’t judge cauliflower by the mushy boiled stuff – wait until you’ve tried roasted cauliflower. Even better, the caramelized onions bring out even more sweetness in this dish that’s full of vitamin C and fiber. Not so sure you like cauliflower as a substitute for mashed potatoes? 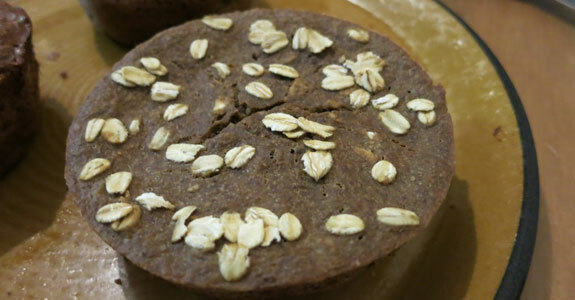 Then try this recipe that’s oh-so-Paleo-friendly. When you roast the vegetables, they produce a bit of sweetness that complements all the earthy flavors of the cauliflower and carrots perfectly. Cauliflower is the answer when you want to replicate Alfredo sauce and don’t want to use any dairy. It creates a creamy texture when it’s cooked up and blended into a sauce. 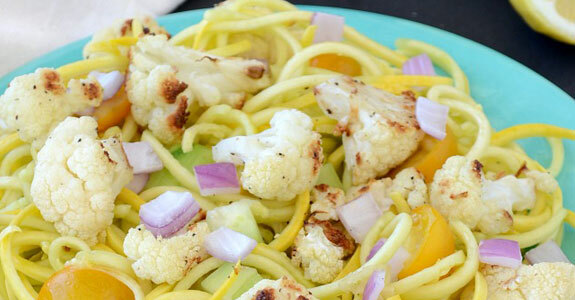 Put it over zucchini noodles and you’ve got a nice meal on your hands. Looking for a new dip for your next get-together? This is it! 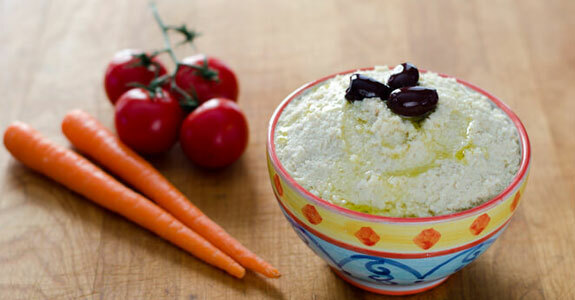 To keep it Paleo, use full-fat Greek yogurt instead of cream cheese. 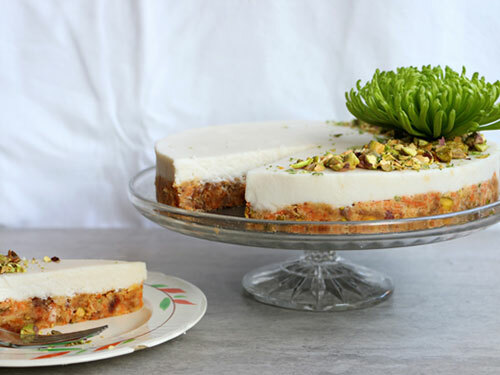 The yogurt will keep it creamy and give it an extra tangy wonderful taste. For your non-Paleo guests, crackers are great with this but for Paleo lovers, serve with a side of crunchy veggies. When people taste your mashed sweet potatoes they’ll wonder why theirs don’t taste as good. That’s because you know the secret: add a little roast cauliflower and some chicken stock and you’re in a whole new world of mashed potatoes! The cauliflower brings an earthy hint and the chicken broth makes them richer tasting. Simple, tasty, classic. That’s this recipe. Cauliflower is packed with vitamin C and fiber so this is a perfectly Paleo and wonderfully healthy side dish. If you like a little heat, add some paprika or crushed red pepper to this dish. Pair with…well, anything! But a grilled fish, using complementary flavors, would be wonderful with this bright citrusy gem of a dish! I love my Paleo plan. Love it. And so do you. But do you ever miss rice like I do? I can’t help it. When I’m having something with Indian flavors, especially, I just want a heaping side of rice. Now we have a solution! And this recipe roasts the cauliflower bits so it’s way easier than other cauliflower rice recipes. 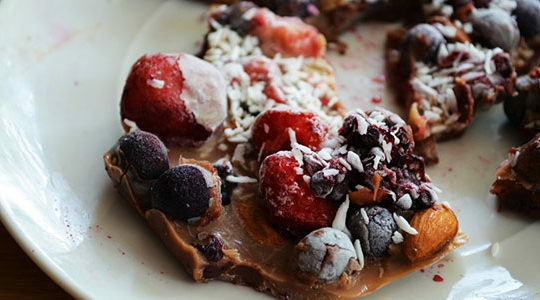 This might be the best healthy snack recipe of all time. 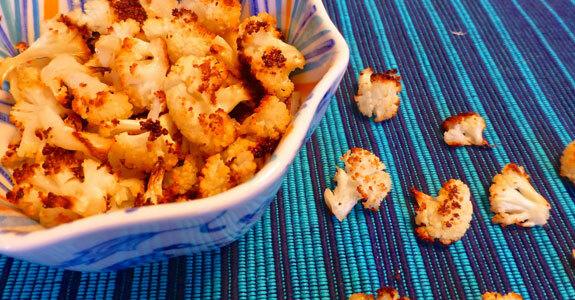 Roasting gives the cauliflower a new kind of crunch and also – did you know? – actually makes the cauliflower healthier than when it’s in its raw state. Then, top with one or even two of your favorite flavors. Think about combos that complement the earthy cauliflower flavor like curry and cinnamon. Creamy. Cilantro. Pesto. Need we say more? Okay, we will say more, even though that does seem to say everything you need to know. This stuff would be great on anything, if you love cilantro (if not, try the suggested basil substitution) to get a whole Paleo meal out of this, broil fish in the oven and use the sauce on it too! Are you one of those people who still turns up their noses when cauliflower shows up on a crudité platter? We don’t blame you. 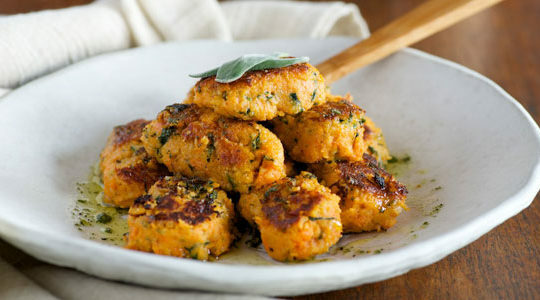 But before you discard this wonderfully crunchy, stuffed with vitamin C and fiber veggie, do try it in its roasted form. As for the toppings, follow this recipe, or your taste buds – cauliflower makes a great base for tons of flavors! This slow-roasted cauliflower dish gives the oven extra time to work its magic on the cauliflower. 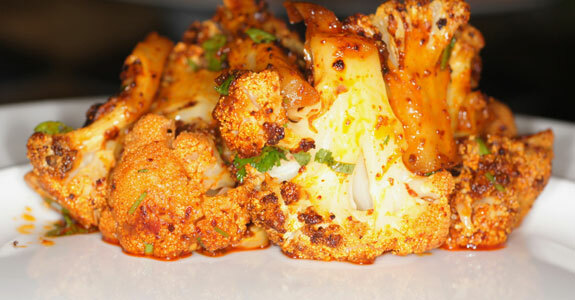 Roasting cauliflower not only makes it yummier, it makes it healthier! Weird, right? And cauliflower is always rich in fiber and vitamin C. The chili powder will awaken your taste buds just the right amount – not too much!